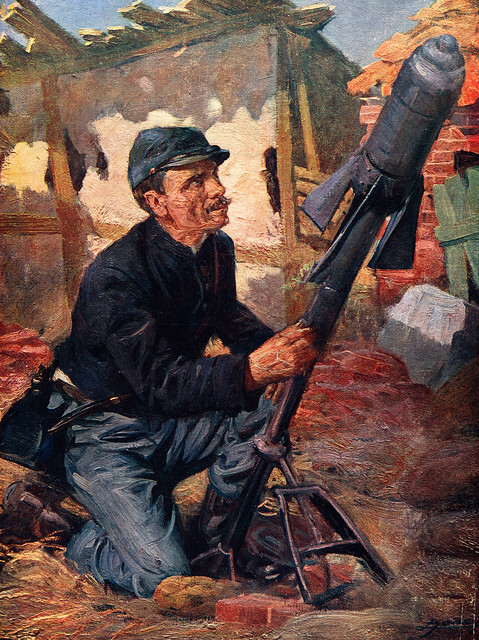 Le Crapouillot – no, this is not a French swear word or a turn of phrase the British Tommy secretly used to describe the French Poilu, but the name given to French Trench Mortar weapons in the Great War. As we saw from the post on Wednesday the French Army was quick to react to the situation of trench warfare and realised that essentially WW1 was a huge siege war – and that in previous siege wars mortars had been used to propel projectiles towards the enemy positions and try and break that siege. The name Le Crapouillot was one used in the trenches; the mortars were described as ‘little toads’ and a toad is ‘crapaud’ in French. In fact far from being the centre of humour the Crapouillot units of the French army were elite troops with specialist kit. The sort of mortars shown in this illustration from 1915 could fire substantial projectiles hundreds of metres across the battlefield and cave in trenches, dugouts and strong-points. Various examples existed and their role on the battlefield from 1915 was vital giving the French Army a good weapon to counter the German Minenwerfer and other types of trench artillery being used at that time. This entry was posted on 04/05/2012 by sommecourt. It was filed under Chemin des Dames, France, French Army, French Front, Verdun, Western Front, WW1 and was tagged with Crapouillot, French Army, French Front, Poilu, Trench Mortar, Trenches, Western Front, WW1.